Anderson was born in South Dakota on May 19, 1920, and he earned his undergraduate degree from the University of Wyoming in 1942. After college, he joined the Air Force and served as a bomber pilot in missions over southern Europe. In 1946, Anderson and his wife Doris moved to Madison and he began his graduate studies in biochemistry at the university. As a graduate student he worked with esteemed biochemist Henry Lardy, an expert in metabolism and sugars. 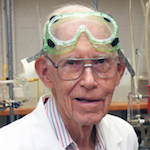 After earning his Ph.D. in 1950, and following a yearlong postdoctoral position in Switzerland, Anderson returned to UW–Madison to join the biochemistry faculty, which he retired from in 1986 to become an Emeritus Professor. But he couldn’t stay away from the laboratory for long. Just a few years later he became a Visiting Senior Professor in the Chemistry Department, where he continued to work in the laboratory of Bassam Shakhashiri and mentored graduate and undergraduate students. 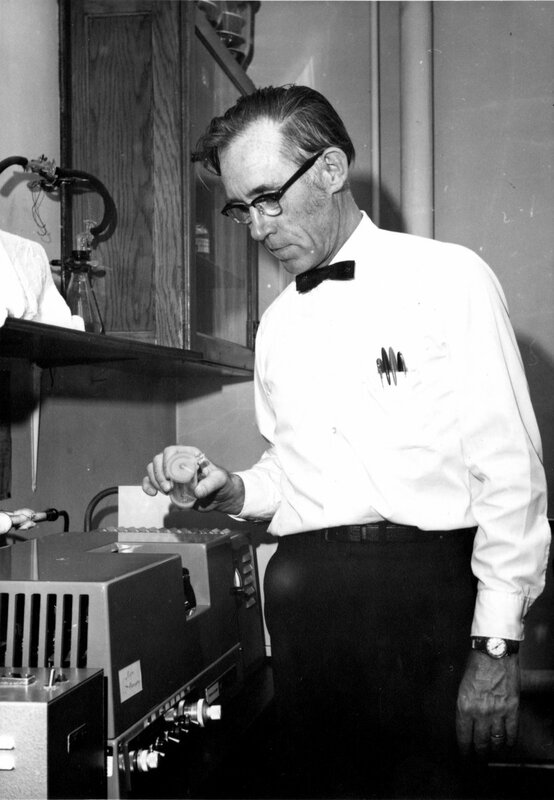 Anderson working in his lab during his tenure in the Department of Biochemistry. File photo: Department of Biochemistry. Members of the Department of Biochemistry remember him as a passionate scientist and kind mentor. He celebrated his 90th birthday with a party in the department and continued to make frequent stops to visit. One of Anderson’s first major scientific contributions was determining the molecular structure of several cyclitols, which are a group of compounds closely related to the sugars. It turned out to be a research area that yielded more than 800 cyclitol and sugar derivatives, most of which are the intermediates to becoming the desired end product. Along the way, Anderson and his research group purified each of the derivatives and meticulously documented and saved them, which led to a collection they held on to. He became a world expert on the structure and chemical synthesis of cyclitols, including the inositols that proved to be central in biological signaling. A few years ago, he decided to donate the collection of 800 molecules to the UW Carbone Cancer Center’s Drug Development Core, where they can serve as a resource for the next generation of scientists looking to discover new drugs for treating diseases. The research and donation were part of a long feature story in CALS Grow magazine. He was a leading expert on naming carbohydrates and many of the nomenclature rules he devised are still in use today. Without his push to devise a common language to discuss carbohydrate structure, studying them would be extremely difficult. Anderson’s career was filled with service and many awards. He was editor of the Journal of Carbohydrate Research for a long period and was involved in multiple initiatives with the American Chemistry Society (ACS). In 1984 he was awarded ACS’s Hudson Award in Carbohydrate Chemistry.